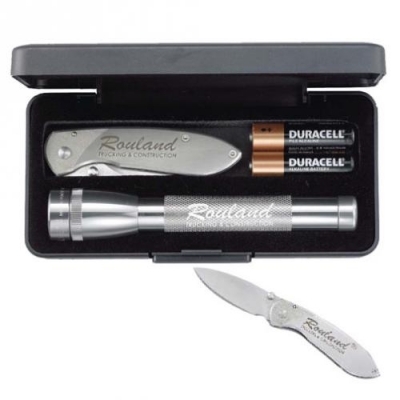 A popular gift set, a Mag-Lite M2A and a Buck Nobleman Pocketknife, both with your company Logo! THE AA MINI MAGLITE® & A BUCK® KNIFE. INCLUDES 2 “AA” BATTERIES AND PACKAGED IN A SLEEK PRESENTATION BOX. Two great brand names in one set. The World Famous “AA” Mini Mag-Lite® paired up with one of Buck’s sleekest knives. The Mag-Lite® is 5 3/4" long. The Buck® knife has a 3 3/4" handle and 2 5/8" blade, and is brushed stainless steel. Please choose Mag-Lite color in the shopping cart. • M2A available in the colors shown in the above drop-down menu. Some colors are an extra charge, which shows in the color menu above. • Price includes laser engraving on both items, one location on each item. Method of Imprinting : Laser engraved on Maglite (Head or Barrel) and Knife Handle. Add'l Location Engraving : $1.17 plus set-up charge.